Beeyoouuuuuteeeefulll!! It HAS changed a whole bunch, even since I started fooling around with it in 2001. Who needs Microsoft or Apple? Wow! If remember those days… Redhat 5 (the original version 5) was one of my first distros. Things are definitely moving forward! Wow, Qt 1.32 and 1.40 rpm’s, but no kafka rpm? Was that screenshot prior to your KDE developer days? So when was the first screenshot taken? I silently miss these old days.. Way more geeky stuff. And the window buttons to the right. In many ways, Patrikas, I’m with you. I was running Slackware when I had a desktop like that, and could fit most of the workings of the distro inside my head. I have less free time to tinker now. Wow… The old desktop is way better than the new one. The window buttons make sense, at least, other than the current “up” and “down” that don’t mean it. Hmmm… the date on that first picture is Oct. 29, and it is Red Hat. That would probably be too early for 1992, and 2009 would be way too late for that look. So that picture must be circa 1998. Yep, long way in 12 years. Ah, that first screenshot certainly takes me back. Thanks for the trip down memory lane. Naturally I’ll switch back to Epiphany or Midori from Chrome once they get them.. ..up to speed. the first one looks like windows 98, the second one looks like what windows will never be able to be. Windows could look like that tomorrow. Vista comes with a dock. Hey what’s that nice dock app? Is it docky? Awn? Thanks. When I think back to what Linux offered and optimized for in terms of workflow back then and now, I think there has been a huge improvement. If you use another DE than gnome and toolkit other than gtk+, your desktop won’t be any different than the first screenshot. Um…so instead of copying Windows 95, now we copy Mac OSX? Flame away, but as someone who cut his teeth on early Slackware when a functional X desktop was a fantasy and the Linux kernel was at .99pl13, I have watched this all unfold, and I have the right to call it as I see it. I suppose you could make the argument that everything that can be done with the desktop paradigm has been done, and Ubuntu/Gnome is just pulling in the best of both worlds…but at least call it what it is. expanding on good ideas, and making them free (as in whatever you want it to be). Sure the community has taken those ideas and made them better, no one can seriously debate that. The evolution is that the current software really does compete with the big alternatives. Lucid’s desktop environment is the most fluid and useful (out of the box) setup I’ve ever seen or used. Look at the home directory for an example of this since of ‘we get it!’. When I first started using linux you had your home directory, and it was empty (maybe a few hidden folders and files for things like bashrc and such). Now it’s a user space that show people how to work with its structure. This may seem like a small thing, but for the users who aren’t 5-10 year veterans of the software this effort towards ‘guidance’ goes miles. To circle back, sure we’ve absorbed/ripped/stolen/improved ideas from other products… my point is, “what’s your point”? I think you are reading too much into what I am saying: I am merely saying that things have changed for the better. Definitely a copy of OSX…the dock, the scrollbar in the gtk+ theme, close/minimize buttons on the left, everything. I’m not complaining though because it does look good. Yeah, keep censoring the comments. As if what I wrote was a lie. The first screen-shot has decent buttons. Protip: I can place the panel in either Left/Right/Up/Down. What happens if I click the minimize/”Down” button and my panel is on the top? That’s right, it doesn’t make any sense. Where are the Ubuntu usability experts now? Sorry, didn’t refreshed the browser tab. Jono Bacon DOES NOT censor the comments, unlike his boss (Mark). Truly awesome! My linux adventure started with Redhat Linux 5.3. Not only that the look got better, but the ease of use and “desktop comfort” is a lot higher. Love it! 🙂 Considering the community involvement is a lot bigger now, it really makes you think where we’ll be in another 10 years right? I was wondering. Is that Docky oder AWN you use? Are there plans to add a Dock to ubuntu by default? From Windows to Mac OS X. First it looked like a Windows clone, and now it looks like an OS X clone? Yeah, that could be called progress, i guess..
An improvement certainly, it has come along way. Still much work to do yet. I might give awn a try, looks good. I would like more work done on the Software Centre so it would be easier to install/update (downgrade if required) the latest releases of applications/packages and also to make it easy for developers to make available commercial applications. Censoring? Comments that are personal, nasty and contributes nothing to the discussion helps no one and doesn’t make the world a better place. I don’t need or want to come across comments like those. Censoring has its place. so what will be after 10 years ? Red Hat is open source. Red Hat just isn’t free. Cent OS is using the source code based on Red Hat however Cent OS is free. Basically if you want enterprise Linux from the RPM side of the spectrum WITH support, Red Hat is where you want to go. If you just want a solid RPM distro to use as your own server or whatever, Cent OS is perfect. hey, maybe in 10 more years, linux\ubuntu will be as functional and easy to use as Windows or OS X! The windows to mac description sounds fair, but only for the screenshots. I believe the mac os similarities are Ubuntu’s own customizations. If you look at KDE SC 4.4 (which is being shipped with Kubuntu lucid), you will see something similar to Windows. But even with those similarities, its also something completely different. You also can’t forget about the other window managers/desktops like enlightenment and xfce. It is my feeling that Free Software remains very innovative and unique while at the same time being similar for new users. Even if you look at the progress Free Software has made since 3 years ago, it still is a huge improvement. I wonder what it will be like in 5 years from now. You are right, a lot has changed. But the impression I’m getting from looking at these two screens is that the former looks a lot simpler and cleaner, and the latter looks quite complicated and confusing. Is the modern desktop really that much better? In many ways, yes, but I’m not convinced that every change has been for the better. looks like it changed from a cheap copy of windows 95, to a cheap copy of osx. go open source! At the risk of sounding like flamebait… your desktop went from a Windows 95 clone to an OSX clone. Where is the innovation in the Linux desktop community? Not to be a bummer though, I love how far F/OSS has come. That’s really not just a Windows 95 clone then, or an OSX clone now. 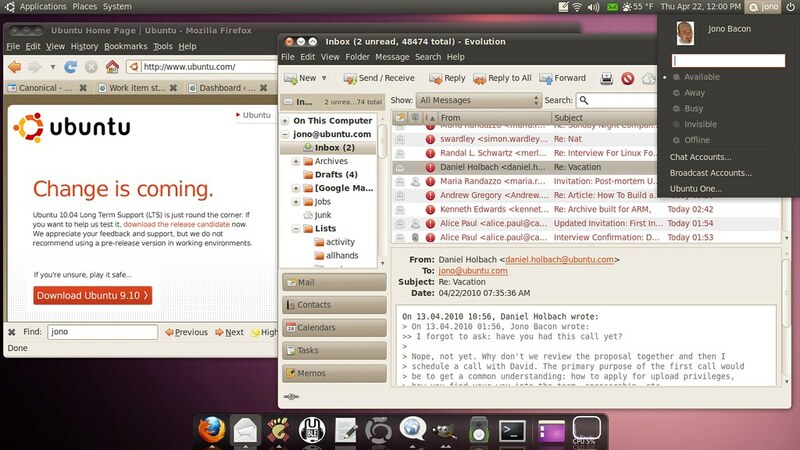 Ubuntu has an applications menu, for example. I started my open source adventure recently with Fedora 12. I am not a geek, just a person who uses a computer to do stuff. I love, love, love my Linux. I would not go back to Windows nor spend the money, if I had it, on Apple. I am so thankful to all the people who work, and have worked, on Linux. I know this a also late but Red Hat was open source 10 years ago when I used it. I started my opensource adventure when i was in highschool, I installed Fedora Core 2 along side my windows 2000 install. Now I’ve got an Archlinux/Windows7 machine. Luv it! Considering the community is getting bigger and bigger and they are really helpful.